For some crazy reason I decided to participate in both the Iowa and Illinois mountain bike series this year. With the Iowa race (Summerset Shootout) on Saturday, I would be able to also make it to the final race of the Illinois Homegrown Races Series on Sunday (Farmdale Festival). I’ve doubled up on races before, but never two mountain bikes races, I knew this would be a super tough weekend! My teammate Lauren and I headed to the race together – thanks for driving!! 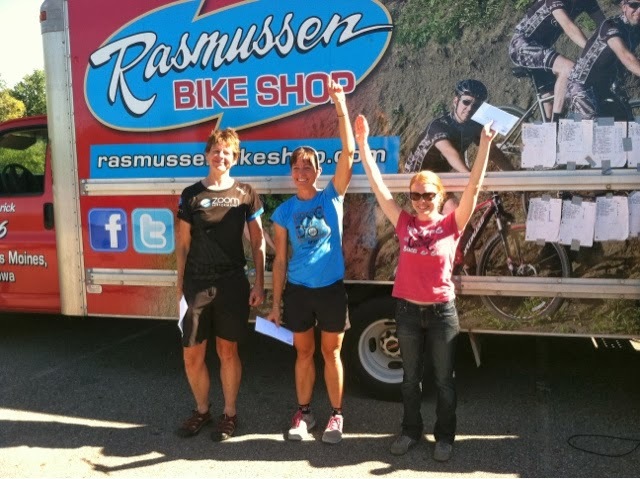 She has been doing super in the cat 2 races this year, so I encouraged her think about doing the cat 1 race. This was the first time for both of us riding these trails and holy cow are they were technical (but also really fun)! I think Lauren immediately regretted signing up for the cat. 1 race during our pre-ride. Sorry – I promise I had no idea! Karmen Woelber, Myself, Lauren Trolley & Leah Kleager. I made it to one of the steep downhill’s (the kind where you do not want to use you brakes for fear of tumbling over your bars) and into a short prairie section with an enormous rock that you had to go over. I probably went into it with a little too much (ok, a lot too much) speed and got my front wheel lifted up but my rear wheel bounced hard off the rock and shot me up into the air. I superman’d over my bars and landed hard on my stomach/hips/right ribs (think belly flop style, with a little sliding action at the end). I could feel my back bending backwards during the impact and I was just waiting for some serious pain. This is definably the hardest I’ve ever hit the ground. To my utter amazement, I was able to get up and run to my bike which landed further down the trail than me. I gave it a quick look over and nothing obvious looked broken, and nothing was broken on me so I hoped back on my bike while reassuring the photographer who witnessed my very ungraceful crash that I was ok.
Lisa was completely out of sight by this point and I was worried that I had let the chasing girls close the gap to me. I sucked it up and continued riding hard, but with a little more caution. My bike was definitely making some creaking noises and with every pedal stroke it felt like I had something sharp poking the inside of my right leg. I could't see anything sticking out from the bike, so i tried my best to ignore it. Gorgeous Trails! Thank you Steve Fuller for the Pic! I made it to lap 2 and was still in second place. I got to the climb right before the area I crashed the previous lap and didn’t have my gearing right so I had to get off the bike. My bibs caught on my saddle and I had a very ungraceful dismount in which I somehow knocked off my chain. Not.My.Day. I managed to get my chain back on right as Karmen, who was in 3rd place caught up. I jumped on my bike and continued on, just completely hammering down the open section hoping to get back a gap. I succeeded but knew the gap wasn’t large. 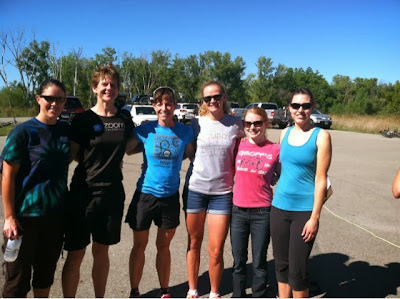 It's always wonderful to race with this group of ladies!